Seen as the epitome of luxe and glamour, the Art Déco style is one of the most influential design movements. Popular in the 1920s and 1930s, it is characterized by sculptural and geometrical shapes, decorative elements, fine craftsmanship and rich materials. Back then, interiors were be filled with glossy floors, black lacquered or mirrored cabinets, ebony veneer tables, sparkling chandelier, velvet and leather upholstery, as well as patterned wallpaper. While the Nordic style is more about straight lines and simplicity, I’ve increasingly noticed new designs that have more embellishments, a more avant-garde look and clearly Art Déco influences. Materials like plaster, chrome, terracotta and smooth-faced stone, among others, as well as round shapes and curved edges are making a big come back. Many Scandinavian interiors that have been shared on the web lately (Nordic Design included) are a good testament to the style’s growing popularity. What started as a micro trend a few years back is now a real phenomenon. While it is still about opulence, today’s Art Déco-inspired style is more understated and au goût du jour. Think rich velvet, touches of pink, a mix of angular shapes and curved lines, sleek metals, geometric patterns, etc. – Nothing new, I hear you say. But it’s about all of these elements combined, with a contemporary Nordic touch and a subdued palette of creamy beiges. The look is simple and elegant, with some more “out there” statement pieces, and a streamlined and modern look. 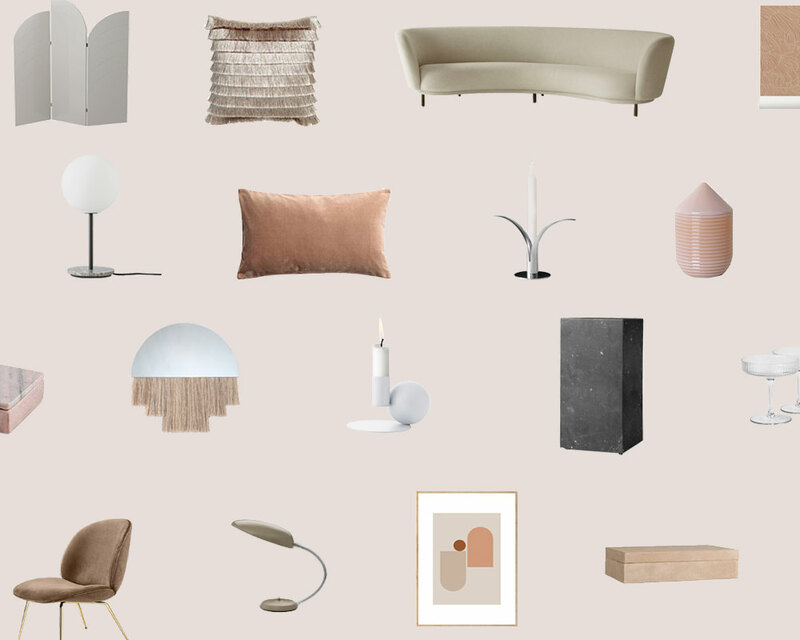 I’ve rounded up my favourite Art Déco-inspired accessories and furniture to help you bring the latest trend to your home. Add a few touches of pink and bust sculptures to the mix, and you’ve got it all right!